Published March 12, 2012 By Anna T. This post may contain affiliate links. Regardless, I only recommend sites I've researched and/or used and trust. What kind of shops do you do? With Confero, there are all sorts of different shops you can do. Their website lists food service, banking, retail, automotive, health care, consumer products, airport and travel, and also entertainment venues. So as you can see, they have a good variety of different things. Some of the shops are in-person and you might also get to do the occasional telephone mystery shop from your home. How much does Confero pay for completed shops? There is no set amount that you will earn. Different projects pay different amounts. Generally (as is the case with most mystery shopping companies) you'll be reimbursed for whatever you spend and also compensated a little extra for your time. Confero only uses Paypal to pay, and they send the payments once a month on the 20th. Related: Another way to get out of the house and earn is Uber Eats. You deliver food orders using your car, bike, or scooter whenever you want! You must be at least 21 years old to sign up. They have a need for shoppers in every US state and also Canada: Alberta, British Columbia, Manitoba, Ontario, Quebec, and Mexico. What are the qualifications? Do you need experience to sign up? If you are dependable, observant, and good at following directions, you can sign up. You do not have to have previous mystery shopper experience. After you're registered, you'll have access to their job board. You can simply look through all the jobs posted and select the ones you're interested in. Expressing your interest does not guarantee you'll get the shop, but it lets them know you want the shop. You can also request to get emails when shops are available in your area. Is Confero free to join? Yes. 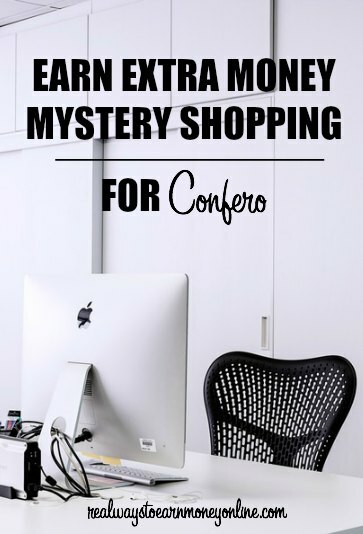 You do not have to pay a dime to offer your mystery shopping services to Confero. I should also note that if you are ever asked to pay to sign up to be a secret shopper through any company, then someone is trying to rip you off. There are hundreds and hundreds of legitimate secret shopper companies that do not require you to pay a dime, ever. Who else has reviewed this company? If you'd like to go ahead and register, you can go here. Looking for Another Way to Get Out of the House and Earn? If you want a flexible job outside the home but don't really think mystery shopping is what you're cut out for, consider driving for Uber Eats instead. This is completely flexible work you can do on your own time, getting paid to deliver food orders to people in your area. They are always looking for new drivers to sign up, and it's possible to get paid every day for the work you do. A lot of mystery shopping companies the paperwork goes on & on. Is company the same way? I enjoy soing mystery shops but some of the paperwork gets overwhelming and makes me think if it’s really worth it. Nice that they also hire in Canada. I’m always getting emails from people looking for opportunities like this in Canada. Thanks, Miranda! Sorry. Meant “Thanks, Anna!” I definitely should have had my coffee this morning! This is one of the only mystery shopping companies I spend my time on. I really like working for them! I had one hiccup with pay but it was resolved. They are really personal and very understanding of times when I failed to turn in my report on time. They make it easy! Thanks for linking to my review on them too Anna!